A few steps away by walk from Saint Peter’s Basilica, Vatican Museum (Sistina Chapel), St. Angel Castle, and subway line A “Cipro”, our B&B Addormì is located inside an elegant and quite building, at the third floor with elevator and porter. Inside a flat of about 150 mq just restructured, Addormì B&B offers to its guest a luminous and peaceful apartment of about 60mq that is independent from the rest of the house, for the exclusive use of our guest!! Our B&B Addormì is composed of: 1. CEDRO room: a large and bright double room (available also a third comfortable bed) with double king size bed, private bathroom (in front of the room) and the direct access to the veranda, furnished in order to give a touch of romanticism to your stay 2. MANGO room: a large and bright double room (available also a third comfortable bed) with double king size bed with private ensuite bathroom, furnished with warm and relaxing crayon colors. 3. a cosy living room with fridge and sink (with the access to the veranda), where you could have a relaxing moment on our comfortable sofa, or connect to internet by our Wi FI Area to collect information about the city, or just consult our maps and city guide we have provided for our guest. 4. A nice and luminous veranda of about 25 mq, decorated with plants and flours and provided with a large table, a large sofa, an armchair and a sunlounger. This is the right place where you can enjoy relax during the warm roman evenings. 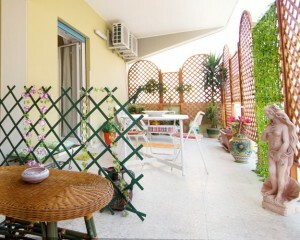 With us you will have no surprises as our B&B has been inspected and is authorized by the City of Rome (APT). We have also been reported as the best week’s structure of a national newspaper "La Repubblica" on 2007 as well as B&B reference in the capital (zone Vatican Museums) in the guide to bed and breakfasts of the Italian Touring Club. If you come by car there will be no problem cause it’s easy to park nearby the B&B at 4 euros for 8 hours (the night is free), or, for most demanding people, fee-paying parking in a cheap garage adjacent to the B&B is available (15 euros for 24 hours). If you want to attend the blessing of our Pope Benedict XVI during the “Angelus” ceremony on Sunday morning, our B&B is ideal place cause you can reach St. Peter’s Square in a few minutes by walk. The train station "Termini" is 10 minutes by subway Line A. We speak English and French fluently. Just outside the door of our building you could see impressive rise up of the "St. Peter Dome" and the majestic St. Peter’s Vatican walls. Several facilities are in the area, such as supermarkets, shops, banks, post office, chemistries, a famous covered market, Andrea Doria, parks for children. For any need, hosts will be supplied with informations. CONTACT: Info and reservations hours from 9 am to 10 pm SERVICES OFFERED (included in price unless otherwise specified): 1. breakfast 2. Cleaning of the rooms 3. Air conditioning in room / warming in winter 4. Wi-Fi Internet 5. In-room safe 6. Linen and towels 7. fridge 8. Semi-professional espresso machine “NESPRESSO” 9. hairdryer 10. Keys of the apartment for much more guests’ freedom 11. New windows soundproofed 12. Luggage service (on request free of charge) 13. Transport to the airports (on request by paying) 14. Museum or city tours with accredited guide (on request by paying) 15. Orthopedic beds and matresses 16. Tourist maps and tourist information SPECIAL PRICE For honeymooners or for weekend of love you can book the whole apartment "dedicated" to a special price, so you can have access to a private suite to enjoy moments of privacy and confidentiality. Also to celebrate special moments we could made welcome sets (floral arrangements, champagne, choreographic setting) on request. Ideal for families and groups of friends, we make discounts for renting the whole apartment. Special rates for weekly and for stays over four nights. Discounts for more than 5 nights. FIVE REASONS TO CHOOSE OUR B & B: 1. nearby the best touristic spots of the city 2. well connected with public transportation services (adjacent to the subway Line A "Cipro" and the bus stops to any direction) 3. attention to hygiene and cleanliness, by the same Mrs. Bruna 3. excellent quality / price ratio 4. cozy, romantic and relaxing 5. courtesy, helpfulness and attention to the needs of our guests Our B&B is in convention with the Ministry of Foreign Affairs - Farnesina In our house you will feel like at home and will find kindness and any comfort. We are very close to the Metro Station A "Cipro" - Vatican Museums (walking 10 minutes to Saint Peter’s Square, Vatican City – we are in the Center of Rome but in a very quiet area. We are strategically placed close to the Vatican Museums, Saint Peter’s square, Vatican City, Sistine Chapel, Borgo Pio, Piazza del Popolo, Villa Pamphili, Foro romano, Auditorium Santa Cecilia, via Cola di Rienzo (famous shopping street), R. A. I (Television Studios), Olympic Stadium, Hotel Ergife, Trastevere - Hotel Hilton In a few minutes either on foot or by the Metro you can reach Saint Peter’s Basilica, Saint Angel Castle, Colosseum, Trevi Fountain, Spanish Steps, Conciliazione Street, Navona Square, Giulia Street, Pantheon, Termini Station, Imperial Forum, Arch of Tito, Arch of Costantine, Circus Maximus, Roman Arches, Michelangelo Artworks Piazza Augusto Imperatore, Piazza del Popolo, Villa Borghese, Campidoglio, and any other central place of Rome. Bus stops for any direction, taxi station, central station are nearby. Main airports (Fiumicino and Ciampino) are easily reachable.